Bancroft Elementary School is a first through fifth grade school located in Chester County, 25 miles southwest of Philadelphia and 15 miles northwest of Wilmington, Delaware. Orchestra, Band, Chorus, Ensemble, Art Club, Math Olympiad, Reading Olympics, D.A.R.E., Book Fairs, Business Partnerships, Inter-generational Classroom Partnerships, Foreign Language Classes, Cultural Enrichment Programs, and more. Daycare is provided before and after school hours by the local Y.M.C.A. An active PTO holds meetings giving talks on various topics pertaining to the elementary child. PTO activities include Book Fairs, Movie Night, Holiday Shoppe, Fall Festival, and other activities that support the home school connection. The elementary years are a time when students begin to develop their academic self-concept and their feelings of competence and confidence as learners. They are beginning to develop decision-making, communication and life skills, as well as character values. It is also a time when students develop and acquire attitudes toward school self, peers, social groups, and family. Elementary teachers play a vital role in the development process. What children learn and experience during their early years can shape their views of themselves and the world and can affect their later success or failure in school, work, and their personal lives. Student services at all of the Kennett Consolidated School District’s elementary schools include guidance, nurse, occupational therapy, physical therapy, hearing, speech, instructional support, reading support, English as a Second Language, special education, and academically talented. 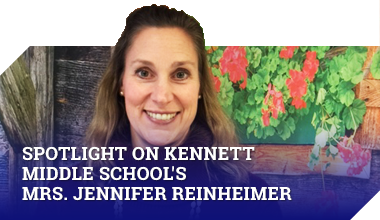 Each of the Kennett Consolidated School District’s three elementary schools follows a standards-based curriculum in reading, language arts, mathematics, science, and social studies. Core goals and curriculum maps have been developed for all subject areas and are available at kcsd.org. Additionally, elementary students receive instruction in music, media studies/Spanish, art, physical education, and health weekly. All teachers utilize a variety of instructional strategies to address the needs of our diverse student population.